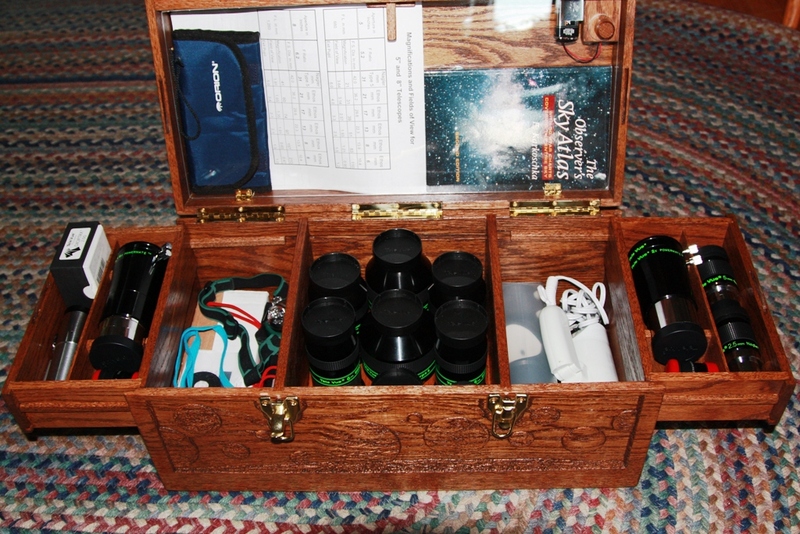 My name is Avtar and I ordered one of your telescope accessory cases a little while back. This is just a quick note to say ‘thank you’ for a wonderful product. Not only is the case beautifully crafted, but it is extremely functional. It looks great in the living room and is perfect for holding all my bits and bobs for a night of star gazing. It truly is a legacy grade case and was made here in the US. Keep up the great work and I look forward to working with you again in the future. I received my eyepiece case earlier this week. The quality and craftsmanship of it exceeded my expectations! I could only dream of creating such art from wood. You have a true gift. I would not hesitate to recommend this product. Thank you again, and I look forward to many years of use of my eyepiece case. As beautiful as the case is to look at I really like its functionality. It’s easy to find the eyepiece you’re looking for. And the built in red light is great. I turn it on and then just open and close the case when I need something and the light is on right where I need it. The glow in the dark emblem is very cool. And it looks to me like you sprinkled a little glow dust on top of the case? It kind of looks like a star field. I’m so thrilled to have the case. I haven’t had it out in public yet but I’m sure it will generate a lot of interest. It has improved my observing experience and it’s beautiful to look at as well. Thanks again for your beautiful handcraft work. Love the case. If you remember, my wife was not too happy that I wanted to purchase one of your cases. When I got home and showed it to her she said “Oh Wow!”. Attached is a picture of me and my buddy Andreas with his case which he won in the prize drawings. The case arrived today and as suspected it is more beautiful in person than in the photo. The attention to detail is amazing. I was blown away by the inset wood on the drawer edge that holds the drawer shut when the top is closed. I was wondering how I was going to keep the drawers closed but you already figured it out! I am also glad I did not get the glowing engraving because the carvings are so nice the way they are. Thank you very much for the heirloom quality case.